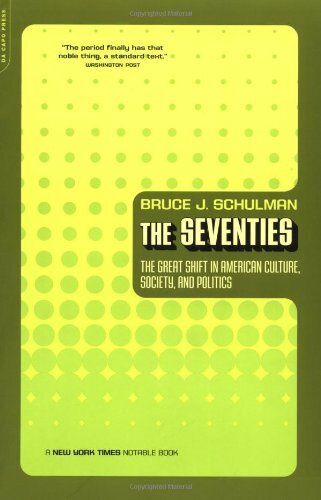 Bruce J. Schulman in his 2001 work The Seventies: The Great Shift in American Culture, Society, and Politics surveys the history of an overlooked decade.Defining the “long 1970s” as the period between Richard Nixon’s entrance in the White House in 1969 and Ronald Reagan’s landslide reelection in 1984, Schulman counters popular conceptions that the decade was seemingly forgettable and unimportant. Instead he argues that during the 1970s the United States experienced a transformation in multiple facets of its character that helped shape our current time. Schulman’s narrative weaves together politics, economics, social developments, and cultural trends to illustrate the significance of this decade. The author asserts that the 1960s effectively ended with the turbulent events of 1968, and when the “Great American Ride,” or booming postwar economy, finally ran its course. During the 1970s, political power in the United States shifted from the Northeast and Midwest to the South and Southwest, the so-called Sunbelt, as Americans, jobs, and federal dollars flocked to these warmer and more business-friendly regions. Politicians such as Richard Nixon, Jimmy Carter, and Ronald Reagan hailed from Sunbelt states, and recognized such political trends. Indeed, the author suggests that the United States encountered no less than a “southernization” of American life in the decade. Americans experienced significant changes in their attitudes during these years. The tragedy of Vietnam and the trauma of Watergate created much skepticism toward government. People looked to the private sphere and its potential for solving economic and societal problems, a key theme of the later 1980s. Yet while conservatism toward government grew amongst the populace in the 1970s, social and cultural legacies from the 1960s became more mainstream. Most Americans, even southerners, accepted the immorality of racial segregation and disfranchisement. 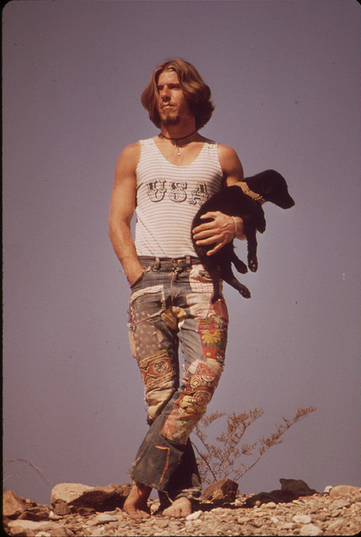 Long hair and outrageous clothing became the norm for Americans of all political and social backgrounds, while sexuality outside of traditional marriage became widely practiced and accepted, especially amongst the younger generation. Schulman contends that personal liberation and rebellion against authority became key themes of the 1970s, as Americans sought individualism through new outlooks on religion, popular culture, and sexuality. Although such tendencies developed, not all Americans welcomed them. The author notes that by the late 1970s, the New Right emerged as a powerful force in politics. Religious conservatives, most notably Jerry Falwell’s Moral Majority, decried social excesses, while anti-feminists, such as Phyllis Schlafly, organized against the Equal Rights Amendment. Affirmative Action and racial busing divided Americans. Economic conservatives railed against taxes. Cold Warriors disillusioned with détente and the outcome of the Vietnam War theorized a new foreign policy, based on American international power and aggressiveness toward the Soviet Union, known as neoconservatism. Schulman proposes that such groups played a major role in Ronald Reagan’s election and reelection to the presidency through exploiting American anxiety. The author commendably illustrates how the 1970s, rather than being an uneventful and lackluster decade, critically affected the course of United States history. The Seventies will prove insightful reading for anyone wishing to reflect upon this transformative time in our nation’s recent past. 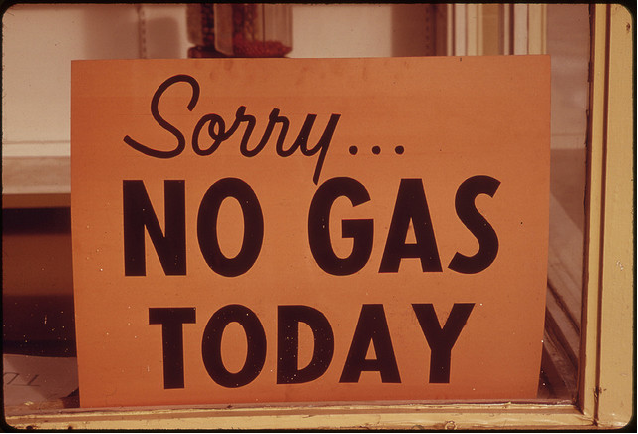 The Environmental Protection Agency’s (EPA) project, Documerica, a collection of photographs taken by freelance photographers from 1971-77 that capture moments related to environmental problems, EPA activities, and everyday life in the 1970s. For more on Documerica, you can also look at our Tumblr blog.